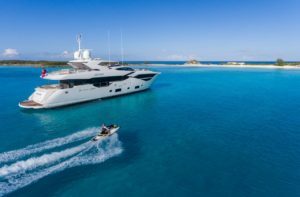 Sunseeker has recently announced it will be showcasing its 131 Yacht and 116 Yacht at this year’s Monaco Yacht Show (September 26th to 29th, Jetee Lucciana). Sunseeker has delivered another nine yachts over 100 ft in the last year, bringing the total to 129 since it entered the segment in 2001. The tri-deck 131 Yacht is the largest model in the current Sunseeker range. The yacht was designed to be tailored in every element of the interior design and layout to the owner’s personal preferences via Sunseeker’s unique ‘Bespoke’ service. Her interior spaces are both voluminous and light thanks to the exceptional feature glass throughout her decks, especially within the master stateroom, saloon and upper saloon which create a light-filled relaxed, comfortable and enjoyable environment for owners and guests. In the standard configuration, accommodation is provided for ten guests across five cabins, with scope for up to 12 to be accommodated depending on the layout and options selected. Exterior deck arrangements use deep lounge style seating to provide the ultimate in comfort for owners and their guests. In addition to this, the external skydeck and upper deck aft cockpit have been lengthened by approximately two metres over and above the previous model, creating additional deck space whilst accommodating new bar and seating layouts. Lower down, the spacious garage can accommodate a tender of up to 6.0m in length, plus two PWCs. Based on the classic Sunseeker deep V hull, this large yacht is equally comfortable operating at 10 knots for an extended cruising range of 1,500 nautical miles or at 23 knots for ultimate performance. The 116 Yacht features elegant lines, an open plan layout and a stylish interior design. Based on the classic Sunseeker deep V hull, the 116 Yacht is equally comfortable operating at 10 knots for an extended cruising range of 1,250 nautical miles or at 26 knots for ultimate performance. The 116 Yacht’s rakish looks and unique design layout make this the ultimate boat for entertaining in style. Its foredeck has been developed into a whole entertainment area of its own, with a new ‘Club’ concept and the option of a large hot tub. Its flybridge boasts a full width, retractable sunroof and an exceptionally generous seating and dining area, with an expansive wet bar, sun-loungers, companion helm seating and optional second hot tub. An electronically operated carbon fibre gull-wing door also provides easy access for the crew from the wheelhouse to the exterior side deck. Inside, the 116 Yacht includes floor to ceiling glazing in the full beam master stateroom, creating bigger and brighter owner’s accommodation affording maximum privacy. Full height glass in the saloon also combines with sleek cut-away deck bulwarks to flood the living accommodation with natural daylight, bringing an astonishing sense of size and space to the interior of an already spacious yacht. As for the 131, the standard layout sleeps 10 guests in five cabins, with scope for up to 12 to be accommodated depending on the layout and options selected. As per the Sunseeker Superyacht, the 116 Yacht also enables its owner to tailor every element of the interior design and layout to their personal preferences.